On a Saturday morning, me and my girlfriends were super hungry after a full morning of running around trying on wedding gowns... who would have thought we could have worked up an appetite trying on dresses? Some of the dresses topped 40lbs of beading and fabric... yeesh! So we were totally looking forward to hitting up Fifendekel Pie Shop Cafe for lunch and pie! 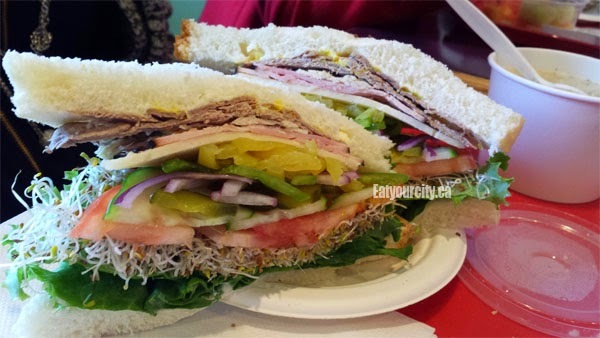 This narrow eatery is tucked into a little strip mall, but well worth searching out for their awesome fully loaded sandwiches made to order on freshly baked bread! 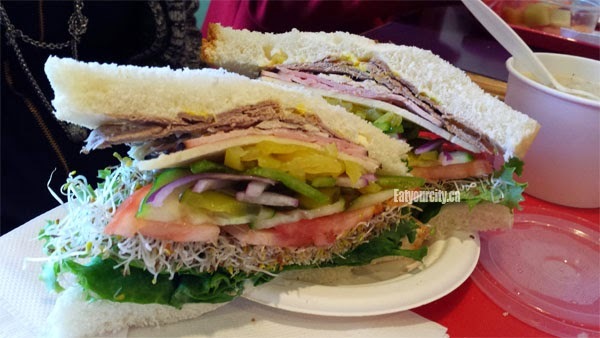 I had my eyes set on the Montreal Smoked sandwich on whole wheat bread (I didn't see the sunflower read this time around like they do in their south location (review here), but they have rye and white too), and topped his with onion, lettuce, cucumbers, tomatoes, sauerkraut, cheese, plenty of mayo, mustard and pickles on the side. Wish they had a panini press or heated up the Montreal smoked meat so the cheese could melt into the sauerkraut, but it was still a super tasty sandwich. A construction worker with his eyes as big as saucers when he saw me pick up my sandwich said "that's a BIG sandwich"... and I laughed and replied "why do you think I come here?" lol! I went with a turkey vegetable soup (no pic) which was chock full of veges and savory goodness. 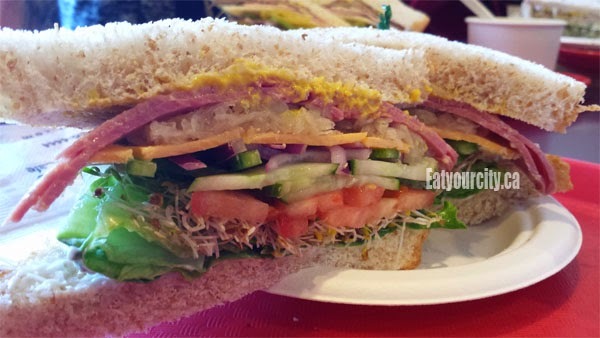 One of my girlfriends had the Auto Bahn, "a turkey, roast beef, and ham road trip" on fresh baked bread, and all the groceries- lettuce, cheese, alfalfa sprouts, cucumbers, tomatos, pickles, onions and pickled hot peppers mayo, butter and mustard! She let me take a bit of hers to nosh on (minus the pickled hot peppers cuz she likes those) and sooo yummy! All my other girlfriends went with the special of the day which was a Tuna sandwich with choice of soup or cup of fresh cut fruit (no pic). Creamy with a good (but not overly so) amount of mayo added to the tuna salad with a bit of tang from diced pickles, it was simple and delicious... a taste of home. We ran out of tummy space to have some dessert, so the next time you're in the west end, join their line ups out the door and lots of happy folks noshing on customized super loaded awesome sandwiches!